doTERRA’s OnGuard protective blend essential oil. Photo courtesy of doTERRA.com. I am kind of the queen of anxieties when it comes to chemicals…don’t worry, I’m talking to a therapist. Most of my fears are probably irrational and take worst case scenario to the max but I am just not comfortable cleaning with things that could potentially be harmful to my health, or my family’s health. So many chemicals have such adverse side effects on our health such as cancers and asthma. So, a few years ago, I spoke with Green Calgary, an organization in the city that gives people information and offers workshops on how to make your home more green and to minimize indoor air pollution. For more information about Green Calgary click, here. In previous posts I have talked about tips for eliminating harsh chemicals into your home as well as ways to get rid of toxins. There are many brands that now offer cleaning products without the harsh chemicals and unnatural perfumes and fragrances which in turn carry extra, unnecessary chemicals. Some of my favourite brands to use for cleaning include the Honest Company and Seventh Generation, amongst others. One of the ways that I have found to clean my house effectively and without all the toxins is through the use of essential oils. They have so many uses, are great smelling and completely natural. There are some precautions you have to take depending on the oil but there are so many benefits to using them both for your home and for your health. I use a lot of cleaning vinegar (7% acidity) which works great for just about anything when mixed with the right ingredients. Vinegar can be mixed with lavender essential oil and baking soda along with hot water in spray bottle for a great all purpose cleaner and the essential oil makes it smell divine. There are so many ways to add these essential oils into your cleaning routine that will make the job easier, healthier and give a way better smell than say, bleach. I had known about essential oils and their benefits for quite some time, and I always loved using a blend of lavendar and peppermint oil with a carrier oil to quell my headaches or to boost my mood. But then, a few months ago my boyfriend purchased a diffuser for me and let me tell you, this changed the essential oil game in my household. Now, not only were essential oils good for use in my cleaning product to give a nice scent, they could be used for aromatherapy as well and to help purify the air in my home. As I started to look more into the essential oil world and what they could be used for, my friend introduced me to a company called doTerra. doTerra is a company that prides itself on essential oil quality. The oils are therapeutic grade and are harvested from plants that then go through a rigorous distillation process to capture the perfect oil. I love the essential oil blends for my diffuser, which I use to improve my mood, help with sleep or to even perk me up if I am feeling sleepy. Some of my favourite blends include: Serenity, Elevation, Purify and Balance. You can read more about essential oil benefits, here. 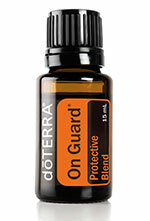 But, the essential oil blend from doTerra that is probably my most used and favourite is the OnGuard protective blend. I use this baby to clean my floors and it makes them spotless and shiny. It is also great as a preventative measure to boost your immunity and it can be used as a cleaner for surfaces and door handles. It can also be diffused to cleanse and purify the air. DoTerra not only offers this as an essential oil blend, it is also offered in a series of cleaning products which is amazing. The blend consists of wild orange peel, clove bud, cinnamon bark, eucalyptus leaf/stem, and rosemary leaf/flower essential oils. You can read more about all of the benefits of OnGuard, here. Some other great essential oils for cleaning include lemon, tea tree, orange, eucalyptus, lavender, lemongrass and so many more. There are just so many benefits of essential oils, for more information or to purchase essential oils, check out my doTerrra Wellness Advocate Page.